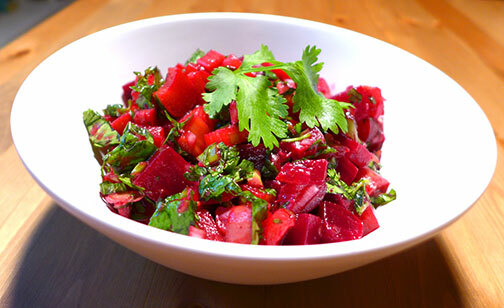 Inspired by a simple rhubarb and scallion recipe in Amnun’s Bukharian cookbook, I decided to try working with rhubarb to create a salad that would be in the Bukharian/Afghani chapter of my Passover cookbook. I found the use of rhubarb as an ingredient in a savory salad intriguing, as my only association with rhubarb was in sweets, cooked with a lot of sugar and combined with strawberries for a preserve or pie. However, when I tasted the rhubarb raw, I found it to be too tart for the American palate. I decided to toss it with a few tablespoons of sugar, let it marinate, then roast it for a mere 5 minutes to not only tenderize the rhubarb, but cut some of the tart/bitterness and bring out its natural fruitiness, which it did. The result was a relish-salad that was both festive as well as summery, something that would go well with any meat barbecue or vegetarian picnic. Try it for this July Fourth and let me know what you think! 1. Preheat oven to 450 degrees F. While oven is heating up, toss rhubarb and sugar in a small baking pan and let sit for 10 minutes (about the time it takes to heat up your oven). Place pan on the top rack of the oven and roast rhubarb until just tender, but not mushy, only about 5 minutes. Remove from heat and cool to room temperature. 2. Combine cooled rhubarb with rest of salad ingredients in a medium mixing bowl. Add the dressing ingredients and toss again. Let salad sit (at room temperature) for 30 minutes to 1 hour to marinate then serve, or store in refrigerator until ready to serve. ← In “Jewish Week,” this week!